Dr. Kamp's clinical activities include general cardiology with an emphasis on noninvasive cardiac electrophysiology and heart failure. He directs an active research program which bridges from the basic functional and electrical properties of heart cells to clinical applications arising from these basic studies, including the use of stem cells to repair damaged heart muscle. Dr. Kamp participates widely in peer review activities, including the editorial board for the journals Circulation Research and Stem Cells, as well as serving on peer review panels for American Heart Association and National Institutes of Health. 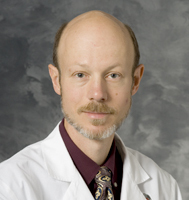 Dr. Kamp's research focuses in three general and related areas: (1) cardiac ion channel proteins and their role in the electrical activity of the heart, including arrhythmias, (2) basic cellular abnormalities responsible for heart failure, and (3) stem cells for the generation of new heart cells and for repair of damaged heart muscle.